I don’t know about you but there is nothing like a looming deadline of an important project to get me motivated and really kick me into high gear. When I have a presentation to work on for a big conference or a manuscript to write, nothing and I mean nothing is going to stand in my way of me organizing my files, replenishing my paper clip dispenser, or watering the half-dead plant in my office. Minor tasks suddenly take on the utmost importance when procrastination kicks in. Some prefer a more flattering term for procrastination – pressure worker. It means putting off doing the work until it can’t put it off any more and eventually doing the work under tight deadlines. The term pressure worker actually implies that we do our best work under pressure. The work always gets done but the question we need to ask ourselves is this: Is it the best quality I am capable of? Oftentimes not. Procrastination is not only a mental stressor it can feel physically exhausting. The unfinished, or unstarted, tasks feel like a weight around your neck and it’s always with you. Procrastination is the stealer of dreams, delayer of gratification, and giver of guilt. We can analyze, psycho-analyze, and sub-psycho-analyze why we procrastinate. We can dig deep into our childhoods and find another thing to blame on our poor mothers. But isn’t doing all that research into ‘why’ just another form of procrastination? And does it really matter anyway? I don’t think so. I think it’s better to just face the fact that we do it and get moving. One way to get beyond the procrastination habit is to identify what your time wasting habits are. What do you do instead of the work you need to do? I shared some of mine above. Once you are aware of what yours are you can minimize or stop doing those things and get on with your work. Procrastination often happens because we are avoiding an undesirable or overwhelming task. 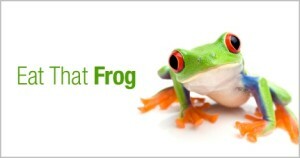 Brian Tracy calls those your frogs. Your frog is your biggest, most important task, the one you are most likely to procrastinate on if you don’t do something about it. What’s your frog? What’s that one thing hanging around your neck and weighing you down? Starting right now, yes now, eat that frog. How do you eat a frog? One bite at a time.